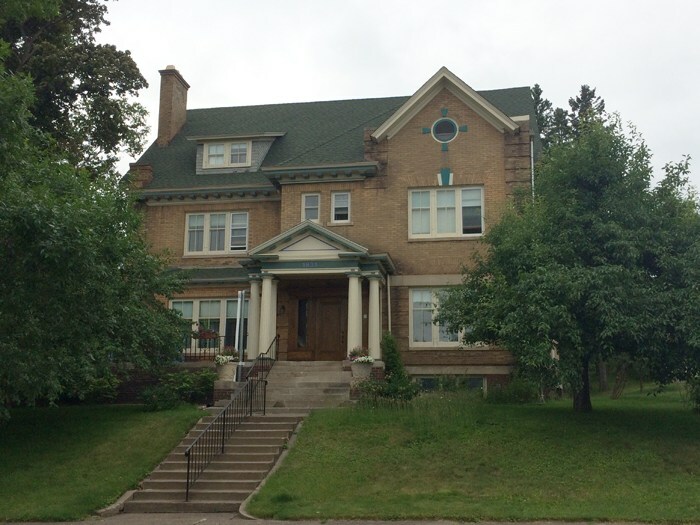 Known historically as the Donald B. and Lillie M. McDonald House, the home was designed by Duluth architects Frederick German and A. Werner Lignell and built in 1908. A two-and-a-half-story structure executed in the Neoclassical Revival style, the house features decorative brick and stone patterns and an entry with classical columns; its original porch was adorned with classical columns and balusters. McDonald built another office block at 17-19 West Superior Street in 1913 designed by William A. Hunt; it served as the home of Kelly Furniture. He also purchased the 1905 Stack & Company Drygoods building next door at 21–23 West Superior Street. A 1993 renovation visually combined the two buildings with one common façade, and the buildings are joined internally as well. Today the two buildings are known together as Lake Superior Place and are home to several businesses, including Visit Duluth, LHB Architects, Blue Cross/Blue Shield of Minnesota, and UBS financial services. Besides his diamond-drilling concern, McDonald was involved in many businesses in the Zenith City and on the Iron Range. At one time he served as president of Northern Cold Storage, Zenith Dredge, the American Exchange Bank of Virginia, and Duluth’s Northern National Bank. Socially he belonged to the Scottish Rite and other Masonic groups, the Rotary Club, the Kitchi Gammi Club, and Northland Country Club. He was also an active curler, as was his brother, Norman, who followed his older sibling from Virginia to Duluth in 1910 and built a house next door at 1817 East Third Street. The pair were instrumental in the construction of Duluth’s 1912 Curling Club. Norman died in Rochester, Minnesota, in 1914 following surgery at the Mayo Clinic. Donald McDonald died March 12, 1935, in Clearwater, Florida, where he and his wife spent winters. Lillie McDonald continued to live at 1831 until 1940 when she moved permanently to Clearwater. She died there in 1956. There are no building records that indicate when the front porch was removed, but it has since been replaced with a patio surrounded by an iron fence. In 1941, new owners converted the single-family home into apartments. As of 2017 it was owned by noted Duluth photographer Jay Steinke and his wife Lisa, who also live in the house. Story by Maryanne C. Norton. Originally published on Zenith City Online (2012–2017). Click here for more stories by Maryanne C. Norton.